Moss Street Market, after six months apart, I had forgotten how much I loved you. I had forgotten all about your sun-drenched playground, your crispy hot donuts, your wild salmon burgers dripping with juice, your endless booths of super-fresh produce, backed by honest-to-goodness sunburned dirt-crusted farmers. This, my first day back, and already I can’t believe I survived so long without your weekly arrival. Moss St Market, my children couldn’t wait to run feral through your enclosure, buying treats for themselves, listening to music, creating at the craft tent, monkeying on the old skool playground equipment. To my children, you are like a mini-carnival every weekend. But to me… To me you are a bounty of food. 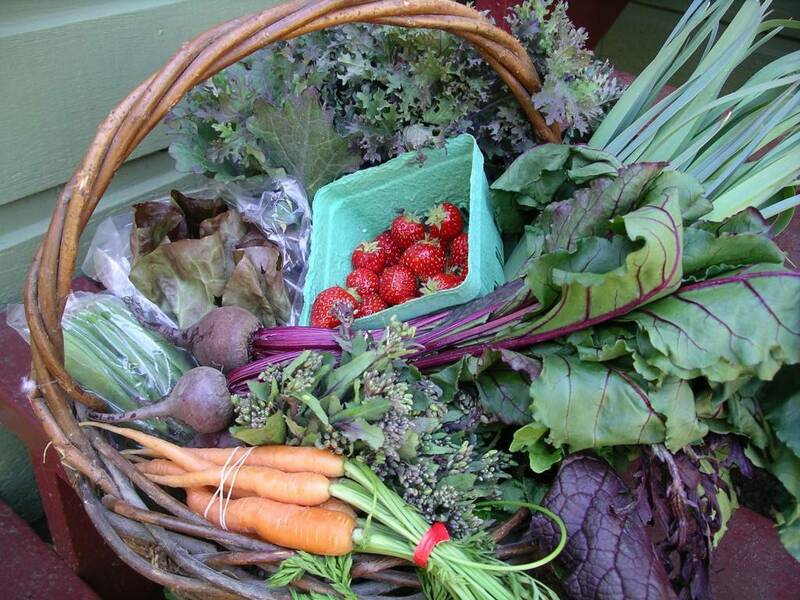 Every type of produce that is seasonal and fresh and beautiful and organic you offer up to the crowds. Today I was so excited about the first-of-the-season strawberries that I over-indulged. I stood in a long line-up and paid $5 for the priviledge of a pint. Oh, but they were so delicious! Still, this indulgence was tempered by the huge basket of organic produce I brought home for under $20: lettuce and kale, snow peas and baby carrots, greenhouse beets and thin new leeks, flowering brassica tops (so much better than broccoli) and a lovely bunch of red mustard greens. All at the peakiest of freshest peaks. This was a steal. A bargain. A week’s worth of fresh vegetables for cheap, bought with no environmental cost to our soil, our water, or our air. And still I was able to support our local economy and local food system while I was at it. Moss St Market, have I mentioned that I love you? But even though it’s the produce that excites me most, you have so much more to offer. After I satisfy my food-gathering urge, I can appreciate the rest. I eye up the locally-made clothing, caress a beautiful wooden salad bowl, contemplate whether I have room for a Galloping Goose sausage, or whether I need another jar of the world’s best apricot butter. I savour a moment of wonderful live music. The kids dash by on one of their rounds, faces dripping with popsicle juice and crusted with cinnamon sugar. “Mom, can you hold this?” as a damp napkin is pressed into my hand. “We want to play on the playground!” And they are off, while I let the music wash over me and look around for a place to sit and keep an eye on the playground. I see a friend and move towards her, ready to soak up the rest of my market morning in comfort. Moss St Market, I am so looking forward to a week’s worth of meals made from your wonderful produce. And I will be seeing you next week.